Staughton Lynd remembers two socialists who wrote extensively about life on the job and struggles at work, Martin Glaberman and Stan Weir. have been asked to say a few words about Marty Glaberman and Stan Weir. It may be that the request is prompted in part by recent events on the West Coast waterfront. I have followed those events with interest, but I am not there and I have not had an opportunity to talk with participants. Accordingly, please consider my remarks about my departed friends and comrades on their own merits, such as they may be, and accept my assurance that no implicit message about current events is intended. Before considering them individually, let’s take a look at their joint significance. The Industrial Workers of the World (IWW) was created in 1905 in the belief that industrial unionism, could it come into being, would tend to be revolutionary.1 The labor radicals who created the IWW, like Eugene Debs, Mother Jones, and Bill Haywood, believed that the great obstacle to labor radicalism was the craft basis of trade unions. At that time a workplace such as a steel mill was organized into separate crafts, each with its own collective bargaining contract. Typically these contracts had different expiration dates. As it appeared to a Debs, Jones, or Haywood, the American Federation of Labor (AF of L) amounted to the American Separation of Labor. Once workers were brought together on an industrial rather than craft or trade basis, a labor movement would emerge in which solidarity – the principle that “an injury to one is an injury to all” – would prevail. Debs could offer an especially poignant version of this thesis. He had been inducted into the Brotherhood of Locomotive Firemen and labored to “build it up.“ Experience taught him that he must bring all railroad workers into a broader coalition, the American Railway Union. The difficulty that young radicals like Glaberman and Weir were obliged to confront in the years during and after World War II was that, yes, industrial unions in steel, auto, packinghouse, electrical manufacture, and many other sectors of the economy had come into being, and federated in the Congress of Industrial Organizations (CIO), but these new unions were not much more radical than the old unions of the AF of L.
One might have expected the IWW to come forward with a comprehensive critique of CIO unionism. This did not occur. And so individual “organic intellectuals,” like Marty and Stan, stepped into the gap and tried to explain what had gone wrong. Off the top, it seems, it was necessary to consider the last phase of Eugene Debs’ self-education. In 1895 he led the American Railway Union into battle against the great railroad corporations of that day in the Pullman Strike, only to have the United States government send troops to Chicago. Debs was imprisoned and the ARU defeated. Behind bars, it seems, Debs concluded that it was also necessary to be a socialist. Marty and Stan were both socialists, indeed were both Trotskyists, but they belonged to different streams of Trotskyist self-activity. Marty adhered to the extraordinary group that called itself “Facing Reality,” made up of followers of CLR James who included, beside Marty, James and Grace Lee Boggs and Raya Dunayevskaya. Stan was a follower of Max Shachtman, who led a particular clump of Trotskyists into opposition not only against the Communist Party but also against orthodox Trotskyism. One of the sorrows of my life is that, somehow, during the entire quarter-century that I knew both Marty and Stan, I was never able to bring them together in the same room. Marty insisted that the answer was not personal. The answer he offered had to do with the content of the collective bargaining contract that the steward administered. To be sure, ordinarily (in those days) the contract contained substantial benefits. But the typical CIO contract also contained a quid pro quo: a clause prohibiting slowdowns and strikes until the expiration of the agreement. The steward, obligated to enforce all aspects of the contract, necessarily became a cop for the boss. In later writing and talks, Marty further explained his advocacy of shopfloor direct action. In 1980 he published a book entitled Wartime Strikes: The Struggle Against the No-Strike Pledge in the UAW During World War II. At the beginning of the war, the UAW bureaucracy, like that of most other unions, had committed itself not to strike for the duration. Prices, however, rose steadily, and the rank and file brought to the national union convention a demand to abandon the no-strike pledge. The union hierarchy sought to sidestep that pressure by arranging to mail to each member of the union a form asking recipients to say whether they wished the pledge to continue. Marty conceded that most of those who returned a form voted Yes. But, Marty countered, records demonstrated that more than half of the workers in Detroit automotive plants had taken part in wildcat strikes! Action together with one’s fellow workers was a better indicator of what workers really felt than forms filled out by each individual in the privacy of his home. Similarly Marty disputed the idea that workers must be converted to socialism before a socialist revolution is possible. Rather, he thought, they become socialists in the process of making a revolution. In Russia, for example, workers who abused their wives, were frequently drunk, were anti-Semitic and often illiterate, nevertheless became revolutionaries as they combated the powers that be. I do not agree with everything Marty Glaberman asserted in “Punching Out.” He describes the Little Steel Strike of 1937 as a loss, indeed as a catastrophe. However, about the time I encountered “Punching Out” I had the opportunity to interview John Sargent, first president of the 18,000 member CIO local union at Inland Steel. John insisted that the settlement of the Little Steel Strike was “a victory of great proportions.”3 He explained that the strike settlement directed a company to bargain collectively with any group of its workers, whether or not they were a majority. As a result there was negotiation of individual issues but, because the Steelworkers were not yet an exclusive collective bargaining representative and there was no contract with a no-strike clause, workers could back up their demands with direct action. Without a contract we secured for ourselves working conditions and wages that we do not have today , and that were better by far than what we do have today in the mill. For example as a result of the enthusiasm of the people in the mill you had a series of strikes, wildcats, shut-downs, slow-downs, anything working people could think of to secure for themselves what they decided they had to have. Aside from such differences about particular episodes of labor history, Marty Glaberman and John Sargent saw things in the same way. Why was it that the CIO union movement, the watchdog of the working class, had become a dog that “don’t bark no more”? The answer lay in the practice of giving up, or “waiving,” the right to strike, or more broadly, the right to take direct action on the shopfloor when, where, for how long, and in whatever manner, rank-and-file workers desire. As a merchant seaman during World War II Stan encountered two old Wobblies, Blackie and Chips, who conducted formal classes on shipboard in which the two passed on the lore of the 1934 San Francisco general strike. There came times when “Red” Weir acted as spokesperson for a crew of sailors who refused to go to sea until their provisions, mattresses, and other material conditions of employment were improved.7 Stan told me that as he wrote about this story for my book, tears were pouring down his face. At the end of the war, Max Shachtman encouraged Stan to get a job as an auto worker, and he joined an assembly line in Oakland. On the street car to work one morning, he stumbled into the Oakland general strike of 1946. 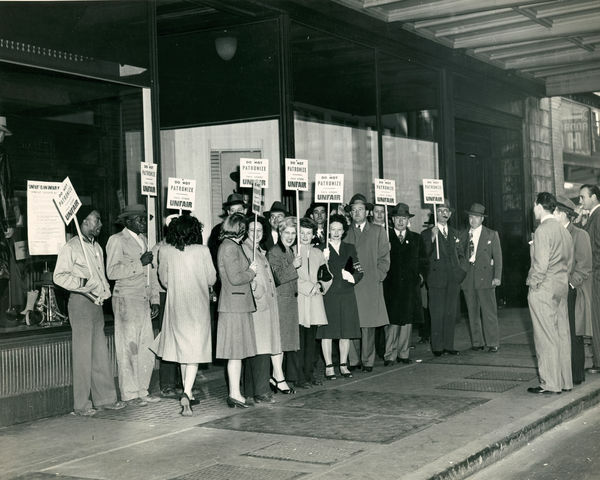 The women who worked at two local department stores were on strike. Policemen were protecting “a string of trucks… Some truck driver or some bus driver or street car conductor asked some policeman about the trucks (this is now part of the mythology) and the policeman told him, ‘This is a scab trucking firm coming in from LA to take stuff to Kahn’s and Hastings’.’” And the truck driver, or bus driver, or street car conductor, didn’t start up his vehicle again. Passengers like Stan climbed out. The general strike had begun. Years later, in an episode that should be of interest to all radicals, Stan Weir describes how he ceased to be an “organizer” and became a worker, and at the same time, more himself.9 Under pressure from McCarthyism his Left political group “disintegrated… considerably.” Stan got a job at General Motors not as a political assignment but because he needed a job. Like Marty Glaberman a foe of union bureaucratization, Stan believed that union members should conduct their business on the shop floor, not in an office away from the plant. It was his observation that in every workplace there is a de facto decision-making structure, which he called the “informal work group.” In the same way that street-corner committees formed during the Oakland general strike, and administered their common affairs quite handily, he thought that informal work groups should network with each other and build up a structure of representation. At an international conference of dock workers in Denmark he learned that there was such a network in Spain, called “La Coordinadora,” went to Spain and, like Lincoln Steffens, came home with the feeling that he had been into the future and it worked. Staughton Lynd is a historian, and has been an activist since his involvement in the Civil Rights Movement and the movement against the Vietnam War. Some of his writings are collected in From Here to There, and with Alice Lynd he is the editor of books including Rank and File and The New Rank and File. An expanded edition of Rank and File, including eight favorite interviews from The New Rank and File, has just been released by Haymarket Books, and his latest book Accompanying: Pathways to Social Change is forthcoming this year from PM Press. 1. See the Manifesto of January 2-4, 1905, summoning workers to a founding convention in June, reprinted in Rebel Voices: An IWW Anthology, ed. Joyce L. Kornbluh, new edition (Oakland, CA: PM Press, 2011), pp. 7-9, and Debs’ speech in Chicago on November 25, 1905, available in American Labor Struggles and Law Histories, ed. Kenneth M. Casebeer (Durham, NC: Carolina Academic Press, 2011), pp. 91-99. 3. John Sargent, “Your Dog Don’t Bark No More,” in Rank and File: Personal Histories by Working-Class Organizers, ed. Alice & Staughton Lynd, expanded edition (Chicago: Haymarket Books, 2011), pp. 105-110. 4. Nick Migas, “How the International Took Over,” in Rank and File, p. 168. 5. Singlejack Solidarity, ed. by George Lipzitz with a Foreword by Norm Diamond (Minneapolis: University of Minnesota Press, 2004); Stan Weir, “The Informal Work Group,” in Rank and File, pp. 179-200; Stan Weir, “Unions with Leaders Who Stay on the Job,” in “We Are All Leaders”: The Alternative Unionism of the Early 1930s, ed. Staughton Lynd (Urbana and Chicago: University of Illinois Press, 1996), pp. 294-334. 6. Rank and File, p. 183; “We Are All Leaders,” pp. 310-315. 7. “We Are All Leaders,” pp. 296-307. 8. Rank and File, pp. 193-195; “We Are All Leaders,” pp. 326-330. Stan Weir is thought to have been the model for the character Joe Link in Harvey Swados’ novel, Standing Fast. 9. Rank and File, pp. 196-197. 10. Rank and File, pp. 192-193.